Southwest Medical Center is proud to announce the addition of nurse practitioner, Laura Kane, to the team of care providers at the Southwest Professional Physicians Internal Medicine clinic. 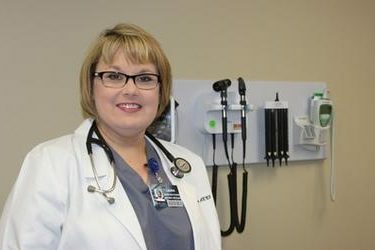 Laura grew up in Fritch, Texas and says she knew in high school she wanted to enter the medical field, and that a neighbor helped turn her towards her career as a nurse practitioner. It was that career pathway which first led her to Southwest Medical Center in the early 1990’s, where she worked full-time in the medical-surgical unit and obstetrics unit while taking part-time nursing classes in Garden City. Kane went on to complete her bachelor of science in nursing from Fort Hays State University before earning her master of science in nursing from the University of Kansas in 2008. Upon receiving her family nurse practitioner certification, Kane returned to caring for patients in Liberal where she worked in clinics with Dr. Ian Yeats, Dr. Brandi Boller, and most recently with pediatrician, Dr. Gurpreet Randhawa. Kane also has experience serving as a nurse practitioner at the Stevens County Medical Clinic in Hugoton and on the Emergency Physician Services team at Via Christi in Wichita. Laura explains that as a long-time resident of Liberal, she’s had the chance to become familiar not only with Southwest Medical Center, but the many patients throughout the community that she has served over the years. Kane added that for her and her husband, Scott, Liberal is their hometown of choice. Laura Kane, APRN, is now seeing patients in the Southwest Professional Physicians Internal Medicine clinic at 305 W. 15th St., Suite 102 inside the Medical Office Building at Southwest Medical Center. Kane is accepting new patients of all ages and accepts most insurances, including Blue Cross/Blue Shield, Medicare, and Kansas and Oklahoma Medicaid. To schedule an appointment, please call (620) 624-0702.